Suppose you make some changes to reduce your energy use -- maybe you added insulation in the attic, did some inside storm windows, and sealed up some air infiltration leaks. So, you look at your fuel bills for last heating season and this heating season, and the heating fuel use actually went up! What happened? The likely answer is that you had a more severe heating season, and the extra fuel for the more severe winter actually offset the reduction for your improvements. This page describes a way you can correct for the severity of the heating seasons between two years and get an apples to apples fuel use comparison. Here is a step by step procedure for doing an apples to apples comparison of fuel use between two years. It uses our house Bozeman, MT as an example. The first thing to do is to get your actual fuel use for the two years you want to compare. You want to compare fuel use and not the dollar amount of your fuel bills, since fuel may have gone up in price. But, this does not take into account the difference in the severity of the 2003 and 2007 heating seasons. I used 2003 as the base year, since that's a year we have fuel bills for and its when we started making most of the changes. 2007 is the last year for which I have full fuel usage numbers. 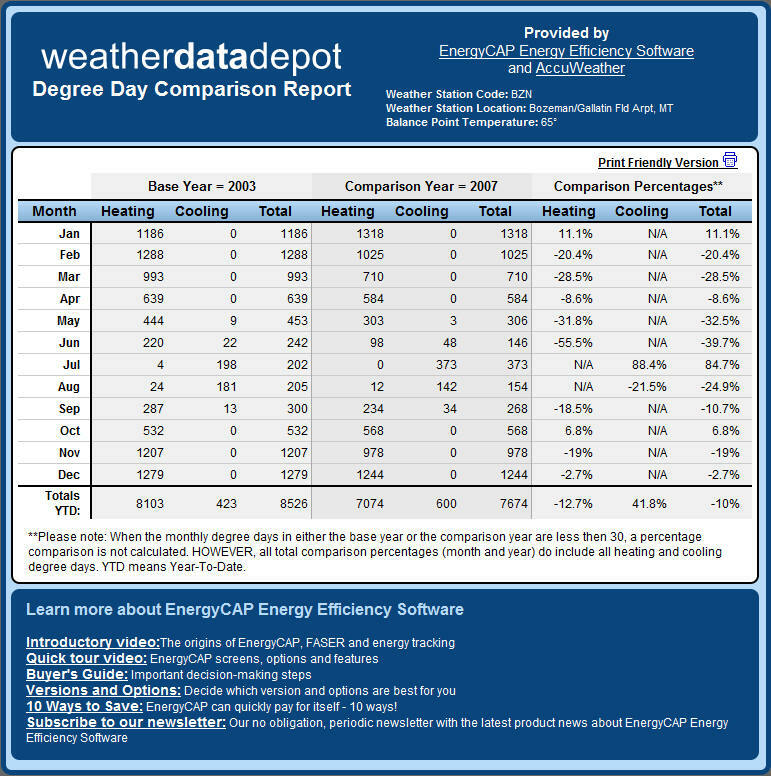 Use the tool listed below to calculate the Heating Degree Days (HDD) for the two years you want to compare. Heating Degree Days are a way of comparing the severity of the heating season -- the higher the HDD total, the colder the winter (a more exact HDD definition from Wikipedia ...). Select a weather reporting station near you. Enter the two years you want to compare. I change the Balance Point from the 60F default to 65F, which is more commonly used. Then click on "FREE Degree Day Report" to get the HDDs for the two years you want to compare. I live near in Bozeman, MT, and my closest weather reporting station is Gallatin Field (about 15 miles away). So, 2007 was about a milder winter, and some of the savings calculated above is due to the milder weather. (875 gallons) (7074 HDD / 8103 HDD ) = 764 gallons saved, or 45% rather than the 51% calculated without the HDD correction.